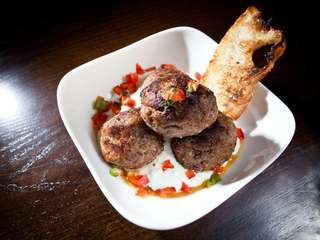 A meatball-centric gastropub with a well-conceived wine list and a range of brews on tap. The cavernous space, built with reclaimed wood and brick is the perfect atmosphere for a fun, social night out. Sunday-Thursday, 11 to 11 p.m.; Friday and Saturday, 11 to 1 a.m. It hardly gets much hipper than That Meetball Place, Long Island's first dedicated meatball restaurant. Even its name (note the spelling) is laced with irony. It is, on the one hand, a place to meet and have a ball. It's also a place to have meatballs -- all manner of them, done up every which way. The cavernous space was built with reclaimed wood and brick. Some nights, it really reverberates. For the highly social, there are three long, communal, high-top tables. And a handsome bar. A glass-paned garage door opens out onto the street, making for indoor-outdoor dining in warmer weather. In keeping with the gastropub vibe is a well-conceived wine list and a range of brews on tap and in bottles. 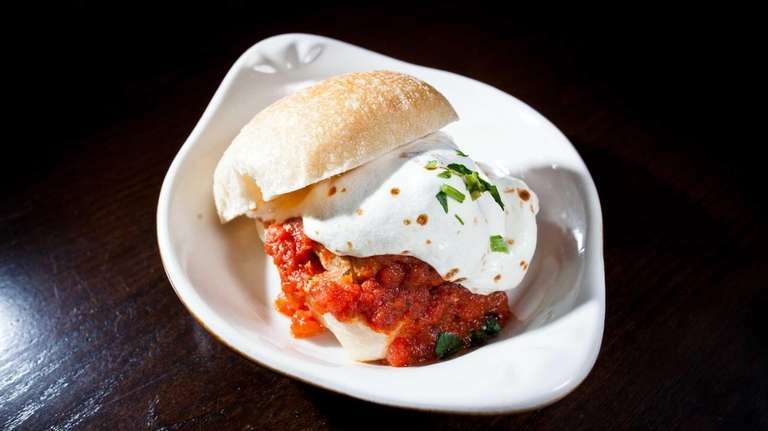 Then, there's chef John Hesse's meatball-centric but veg-friendly menu. Pick your meatballs, your sauce and, finally, a style. You also can go for salads, soups and sides. One night, Italian wedding soup turns out a bit too salty, but that day's Cajun tomato bisque lights up the palate. Another time, a burrata salad falls flat, due to too many ingredients and an overdose of sweet balsamic vinegar. Better bet: a "twisted" wedge salad, wherein a ball of iceberg is showered with bacon and chopped tomato and served with blue cheese dressing. Tucked into two slider rolls, respectively, are mildly spicy "balls of fire" made with ground pork, chorizo and black beans, and a croquette-like seafood ball done with shrimp, cod, carrots and peppers. Also from the fry basket: lobster risotto balls, which work nicely with a mushroom cream sauce. Overtones of cinnamon and cloves inform the Moroccan lamb, ordered in a bowl, atop a cool tzatziki sauce. Best balls, not surprisingly, are the plush and savory beef, pork and veal classics over fresh al dente rigatoni in a spicy marinara. Among composed sandwiches, a winner is the veg-da-ball crunchy, wholesome vegetable spheres on a toasted baguette with grilled portobello and a roasted-pepper spread. Best to forego the cannonball, which stars fairly bland chicken balls. Among side dishes, the risotto of the day -- featuring broccoli raab and sausage -- gets it right on flavor and texture, but macaroni and cheese is way too mushy. To conclude, an Oreo smash shake isn't quite thick enough, although its schlag (rich whipped cream) topping is a dream. And a flat (not globular) chocolate batter, white chocolate chip cookie, served in an iron skillet, is hot, soft and rich. It's topped with gelato.